1. Make the chive crème fraîche by mixing together the crème fraîche, chives and half the lemon zest. 2. Make the beurre noisette by placing 50g of the butter into a small saucepan, and warming over moderate heat until the butter turns light golden and smells nutty. Remove from the heat and strain. 3. To make the omelette, crack the eggs into a bowl, add the milk,add 1 tbsp of the chive crème fraîche and 10g of the butter. Whisk until fully incorporated. 4. Melt the remaining 10g butter in a small, non-stick frying pan over a low heat. Add the egg mixture, and mix with a spatula until the eggs start to cook. 5. When the eggs are almost done and resemble loose scrambled eggs, turn off the heat, scatter over the Parmigianno Reggiano, 1 tbsp of the chive crème fraîche and the smoked salmon. Scatter over the remaining lemon zest and a little lemon juice. 6. 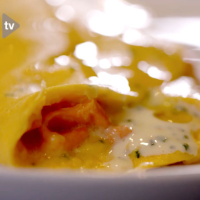 Gently fold the omelette in half, and serve with a drizzle of the beurre noisette and a little more chive crème fraîche, if you like.